Left and above: Mahogany & Satinwood strung and decorated inverse breakfront cabinet bookcase 7' 8" high, 10' 3" wide & 1' 8" deep. 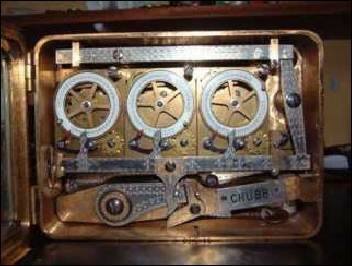 Fitted with eleven Chubb locks, (one shown above) all manufactured mid October 1887 and keyed alike, with consecutive serial numbers. Pictures courtesy of Butchoff Antiques, London. This is how it all started - In Sept 2001 Peter Gunn received a phone call from Butchoff Antiques asking if he could help them to date a cabinet bookcase fitted with Chubb locks. Having made several attempts to locate the Chubb Archive they had been advised he might be able to provide a date for the locks. Papers from 1970 indicated 1887-1888 but it was possible to be more specific once the tables had been created. As the official Archive wasn’t accessible, Butchoffs suggested the antiques trade would find Peter’s assistance very useful and so www.chubbarchive.co.uk was born. Today the site and accumulated documents and artefacts is constantly updated by The History of Locks Museum who continue with the work started by Peter. Do get in touch if we can help with your Chubb related enquires. 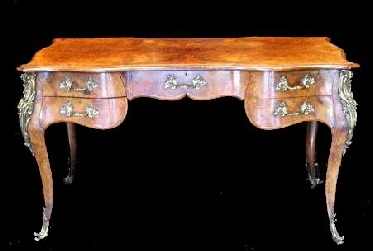 A very fine quality walnut & gilt metal mounted writing desk of inverted break front serpentine form with figured walnut top strung with box wood, moulded edge and canted corners, above a central shaped draw flanked by pairs of scroll shaped drawers fitted with consecutively numbered and keyed-alike Chubb locks manufactured October 1856. The whole raised on gilt metal mounted cabriole legs terminating in scrolling sabots, in the manner of Gillow. 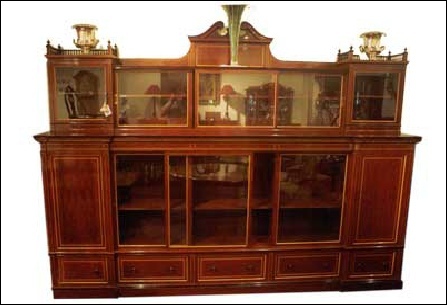 English made Mahogany Display Cabinet in Continental Style fitted with two Chubb Mortice Locks dated July 1880, both keyed alike. The lock on this jewel Box (dated as Friday 26th November 1897) would have been made at the Glengall Road Factory off the Old Kent Road in South London and will almost certainly have the locksmiths' mark stamped somewhere inside the case. Lock manufacture was located there from 1882 until the new Factory opened at Railway Street, Wolverhampton in 1898. 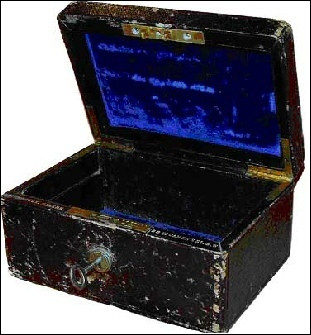 A London Jeweller's probably made the jewel box for Chubb for sale from the London Office. This Time Lock dates from about 1900. 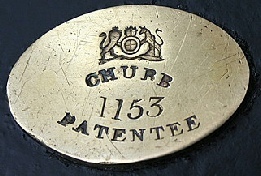 Although marked ‘CHUBB’ it was manufactured by the Sargent & Greenleaf Co. of Rochester, New York. Chubb had negotiated an agreement with this well known American Manufacturer which allowed the attachment of a CHUBB nameplate. 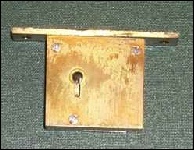 This Lock was installed on a Chubb Strongroom Door made for display at a Paris Exhibition in 1901. Following this, the door became part of a Chubb Vault supplied to the London Head Office of one of the major UK Banks. 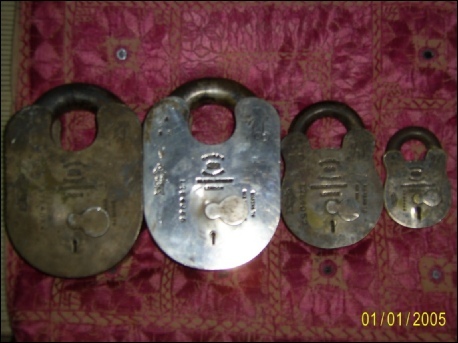 Four padlocks from a master keyed set, all silver plated and manufactured between Thursday 5th and Tuesday 10th November 1921, for an order received from the Maharajah of Patiala. The large padlocks (4” size) were almost certainly for the doors to the Elephant House. All padlocks were to differ, two suite keys each, with a controlling Signet Ring Master Key. Locksmiths name - Mr. T.Hart. 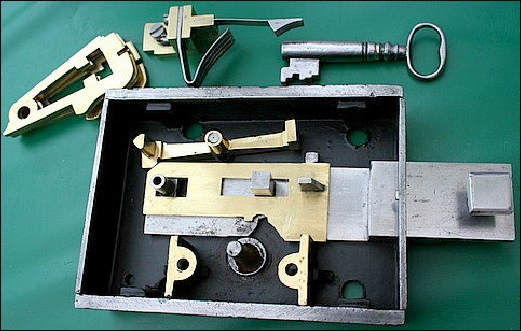 This is a complex and extremely rare lock. It is one of two sequentially numbered locks dating from the early 1850s. My thanks go to www.antique-locks.com for making this picture available and a full description of the lock can be found here. Chubb’s Lock Register No.1 dates the lock to April 1821. 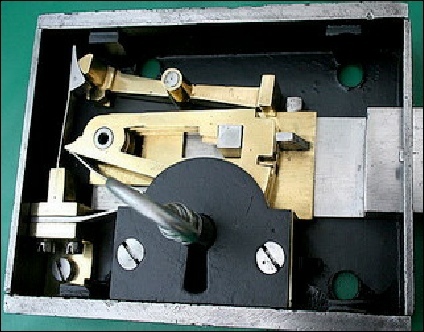 The picture below shows the combined detector spring operating with the ‘see-saw’ detector and the lever springs. End slots in the levers can also be seen, into which the Detector Plate’s flat stump moves when the levers are over-lifted and the Detector is activated. 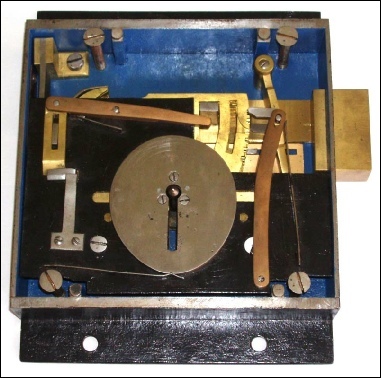 The mechanism comprises four brass levers on top of the brass detector plate and the main bolt assembly (steel) with the ‘see-saw’ detector above. 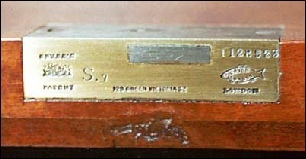 This modification to the original 1818 design did away with the need to carry two different keys; one to operate the lock and the other to release the detector. In the locked position with the detector activated, the lock may be opened by inserting the key and moving it a quarter turn to start the process of unlocking. The key is then pulled outward and turned further until it de-activates the detector and the stump moves out of the lever slots. In the picture, above right, the levers and combined lever/detector spring assembly have been removed to show the detector plate with its flat stump and the circular ward at the base of the drill pin.